I guess all I’m saying is that now our women’s team have deservedly gotten themselves amongst the top four teams in the world, if they are to ever fall from that status, please, please don’t let it be for lack of support, whether it be from their union, the media, corporate sponsors or the wider general public. That was a quote from my writeup of Ireland's World Cup semifinal defeat to England three years ago. A bit like Thursday, during in the build up to that match the fan in me was holding the rational rugby observer hostage and I really thought we could do it. Then the match kicked off. Since I have left it a couple of days before doing the writeup, you probably don't want me to thrash my way through the 80 minutes again if you're an Irish fan. We were quite simply outplayed and outcoached for the entirety. Sure, we did much better in the second half and dominated possession wise but with a 21-point cushion our opposition were happy enough to let us have the ball and even then it took us to the very end to dot down. "I want to be in a semifinal and France are in the way." ...as if it was a waste of time saying something like that without backing it up. Well I would argue on two fronts - first, while initially it might seem like a statement of arrogance it is more one of attitude, and second, it came from an individual player who I think not only backed it up, but actually worded the comment perfectly as it matches her style of rugby. Jenny was just breaking into the Ireland team that lost to England in 2014 but even then her impact from the bench was telling, an amazing crash ball option. One of the tactical shortcomings I felt Ireland had this time around was not using her enough. But the most effective asset of her game has to be tackling. When the opposition has the ball you can see Murphy's attitude in spades. She doesn't merely tackle to stop one opponent; she expects each hit to produce a turnover. If somehow the player manages an offload, she gets up and seeks out someone else to hammer until the job is done. The problem this time around is that the French were just that fraction of a second quicker at offloading, at running in support, at clearing out in the tackle, the list goes on. All the effort and attitude in the world isn't good enough when your opposition is beating you at pretty much everything. And it wasn't just a question of skill either - tactically we brought a sword to a gunfight. Our wins against both Australia and Japan were hard fought but still with a disciplined showing from the forwards we were able to get over the adversity and those were indeed impressive performances. Meanwhile, however, the French were making much easier work of the same two teams and it was clear our work was cut out in the final pool match. Having the ability to maul effectively and roll through double digits of phases over and over are good things in themselves for any rugby team...but when you're up against a well-coached outfit that is ready for this and has plans to counter them, as much as I hate resorting to this cliché, you need a plan B. I'm not so sure ours was even assigned a letter - it was just "THE plan". Most infuriating on the night in this regard was the lineout. We had a potent weapon in Maz Reilly catching the ball and a well-drilled maul forming around her to march down the field...a score was possible from anywhere on the park, once the opposition let us do it, that is. The French literally did not "play ball" and it took us way, way, too long to fix the problem with several good field positions wasted in the process. But now let's go back to my original quote from 2014. As it turns out, we are clearly not in the top four in the world three years later, and by a long stretch. Is this the fault of those on my list? In some ways it's ironic that our tournament ended against France because our Six Nations clash with them in 2012 is what highlighted the deficiencies of the support the women's outfit were getting from the IRFU at the time. They probably would have been better off hitchhiking to Pau as I recall. Since then, however, the support has improved drastically, and the results on the pitch have been amazing. Grand Slam 2013, World Cup semifinal 2014, Six Nations champions 2015. That is most certainly "not nothing". So why now do we see this gulf in class? 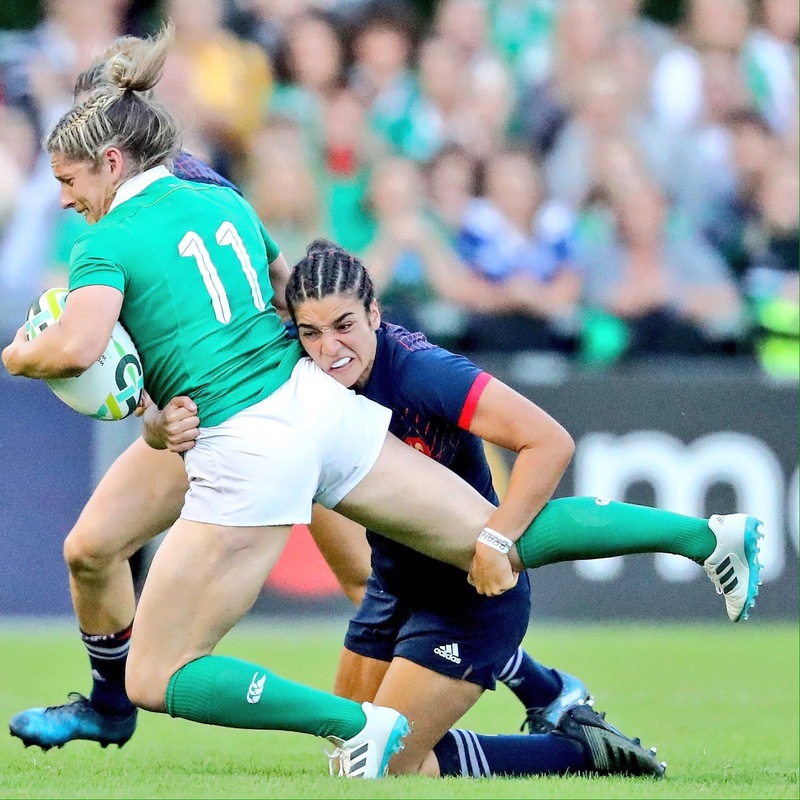 Well losing our talismanic skipper Niamh Briggs just before the tournament certainly didn't help. I thought her deputies at full back did quite well all things considered especially Hannah Tyrell, but Briggs would have brought that extra bit of leadership and x-factor that the squad required - remember it had already been shorn of such monumental leaders as Fiona Coughlan and Lynne Cantwell since the last World Cup. But it's about a lot more than missing players. Support-wise you can always say a union could do more, and no doubt they could. To be fair though, no matter how much you do, there's always the possibility that other unions are moving at a much faster pace and that is definitely the case with England, New Zealand, France and the USA, all of whom made it through to the final four in WRWC2017. I enjoy rugby sevens as much as the next fan. but for me it should always, always, ALWAYS play second fiddle to the XV code. However, when the IRFU finally committed to the shorter version of the game, with the women in particular it meant having to make big decisions with regard to player pool. With important qualifying sevens tournaments going on at the same time as the Six Nations, we simply don't have enough talent to send a competitive squad there AND keep our main group together so priorities had to be ironed out and once that has been decided, I guess the chips must fall where they may. Now to be clear - I'm not saying there is absolutely no blame at the feet of the Irish set-up, especially the coaching...they were found wanting and many lessons have been learned. But I must also harp on the fact that women's top level rugby is still a frontier being fully explored by all nations and some are better equipped for doing so than others. Just look at the leaps and bounds at club level made by England with their Women's Premiership and France with their Top 8. In the latter case, their players may be amateur but they still get tough competitive rugby throughout the season. What do the Irish get to prepare for the big matches? Yes, there are now November internationals but after that there are a few inter-provincials and that's it. Some like interim skipper and brilliant openside Claire Molloy actually work in England and thus can reap the benefits playing with a club like Bristol but the wider squad definitely need something like their provinces in a Pro14 or a Heineken Cup (obviously on a much smaller scale given it's not professional though I still reckon it could be done) otherwise the gap could become much wider. Lets not forget the fact that we're hosting this tournament either - the first time we have done so for a major rugby event like this. Of course that fact adds to the disappointment from last Thursday, but in other ways it should give us a sense of pride - my only complaint was the version of "Ireland's Call" we played before our matches. Otherwise it seems Garrett Tubridy & the IRFU have done us proud and it can only help our bid for RWC2023. When it comes to media coverage, well perhaps our national broadcaster could have aired an extra pool match or two like England v USA or Canada v New Zealand, but overall the broadcasts by them and eirSport had decent analysis mostly from ex Irish women's players, and for the most part the print media seem to have gotten the balance right as well. Having said that, I knew this competition was on, so I was actually looking for it. A lot of people I know who are big Irish rugby fans throughout the men's tournaments didn't seem to even know this thing was on. Whether that's down to the media or not is up for debate. From all reports the atmosphere down at UCD was electric for all three matchdays, so there is no doubt the women's game enjoys a very good core support which is getting bigger. But given we have no problem filling out the Aviva Stadium for international matches, I still have to wonder where all the support was for an Irish team hosting a World Cup. I mean we're talking major tumbleweeds all over the place, even online where all it takes is a few taps to produce something like "Come on Ireland! #WRWC2017". The silence has been deafening from many quarters. Guys who think that they're big @leinsterrugby/@IrishRugby fans who didn't support the #WRWC2017 aren't actual rugby fans. Let's just say I mostly agree with the sentiments expressed in the above tweet. When you've looked forward to a tournament for so long only for it to end in such bitter disappointment, it's easy to lash out on twitter but in this case I reckon a decent target was found. To be honest I'm not even sure this writeup will even be read by more than a few diehards! Doesn't mean I regret doing it though. I have enjoyed the tournament despite this result and I'm looking forward to Ireland's quest for a high finish where they face a rematch with Australia on Tuesday. Best of luck to the girls and to all up in Belfast involved in organising it.